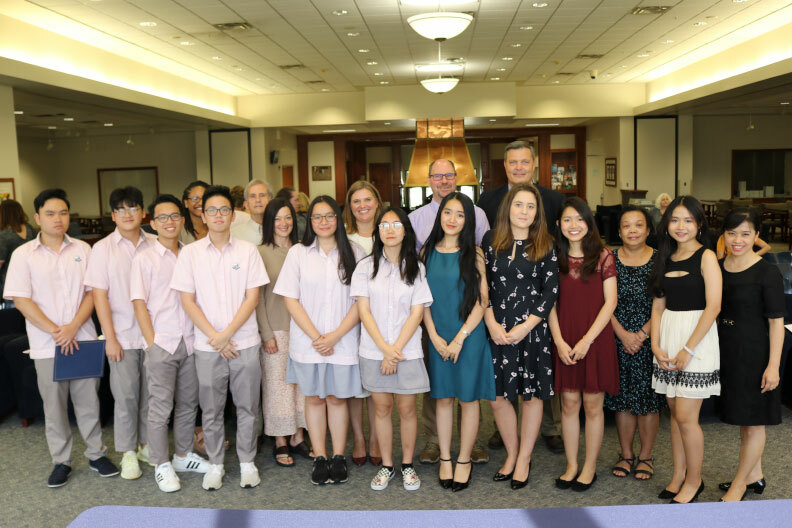 As part of Elmhurst College’s ongoing efforts to become a more global campus, the College recently celebrated 10 international high school students who took part in the second annual Elmhurst College 2018 Summer Immersion Program. During the nearly monthlong academic and cultural program, international students experienced what college life in the U.S. is like, and immersed themselves in the fun and excitement of a busy Chicago summer. They took a course in global business, and learned about choosing and attending a college in the U.S. They also plunged into a whirlwind of cultural activities that included Major League Baseball, high-end shopping, Chicago sightseeing and even a camping trip. At the program’s graduation ceremony on Aug. 1, the students, from different cities and high schools in Vietnam and Greece, received a certificate of achievement, college credit for their coursework, and a $2,000 scholarship. They also were enthusiastically invited to rejoin the Elmhurst College community one day, as full-time students. That’s the wish of 16-year-old Evelyn Do, from Da Nang, Vietnam. The Summer Immersion Program marked Do’s first trip to the U.S., and she was painfully shy during her first days here. But by the end, she had grown far more outgoing and confident. Her favorite experience from the program was the camping trip and sitting around the fire, talking.